Temporary Foreign Worker Programs [TFWPs] in Canada are not a new phenomenon. However, with exponentially increasing use of this program, continuous changes at the regulatory level in the past decade, and burgeoning literature critical of the TFWPs, it is quickly becoming a topic of significant and contentious debate in Canadian law and policy. This presentation will engage in a critical inquiry of the TFWPs, examining how the regulatory structure of these Programs contributes to a state of unfreedom for migrant workers. Beginning with an exploration of the underlying context in which low-skill labour migration occurs, as dependent on the creation and sustenance of a migrant economy in which differential rights are normalized and migrants are systematically excluded from social, political and legal belonging, this presentation will expose a landscape which produces conditions for unfreedom. Building from this context, the regulatory structure of the TFWPs, and specific measures under the programs which produce conditions of unfreedom for migrant workers will be examined, including: the employer-specific work permit; limits on participation and time in Canada and the lack of access to permanent residency; and, jurisdictional limitations with respect to the regulation of employers and third-party recruiters. Ultimately, this presentation will argue that the regulatory regime governing the TFWPs operates largely at the expense of migrant workers’ rights, creates mechanisms which produce precariousness and dependence for both migrant workers and sending countries, and fails to live up to the promise of the “triple win” scenario. Bethanie Hastie is a doctoral candidate, under the supervision of Professor François Crépeau, at the Institute of Comparative Law, McGill University. She holds a SSHRC Doctoral Fellowship, and is a former O’Brien Doctoral Fellow at the Centre for Human Rights and Legal Pluralism. 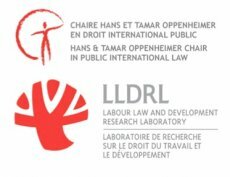 This event is a collaboration between the Oppenheimer Chair in Public International Law, and the Labour Law and Development Research Laboratory.